As we get more into the warmer summer months, we want to send out a reminder about swimming and recreation in our beautiful part of Oregon. 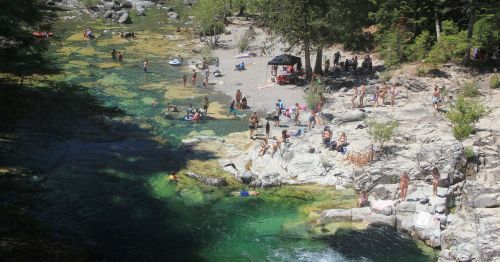 Visitors from around Oregon are drawn to the Santiam area to enjoy areas such as the Three Pools recreation area. As these areas are fun to be around, they can also be extremely dangerous. Mountain snow run-off fills our lakes and streams with ice cold water which can be deceiving when its 80+ degrees outside. Swimers often find a cold debilitating welcome to the water in these early months which can make it tough especially for unexperienced swimmers. Please follow these general guidelines to make yours (and others) summertime a safe and fun one. When you go out to enjoy the waters this year, please remember to bring with you some flotation devices including life jackets and even throw able floats. Have an emergency plan. In most areas in the Detroit Recreational area there is no cell phone service which means someone may have to compete with oncoming traffic on a one lane road all the way to the Stayton Elkhorn Fire Station for the nearest phone.